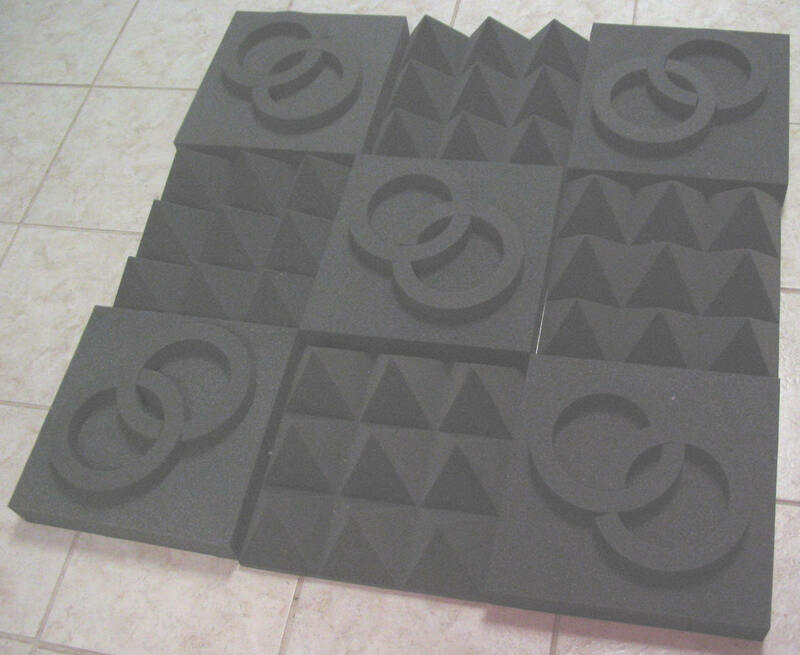 Our complete room kits are designed to make the job of improving the overall look of your studio, control room, or home theatre that is easy and affordable. 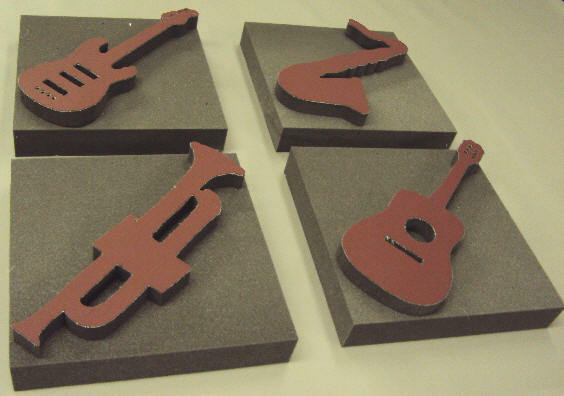 These kits are perfect and are completely do-it-yourself. 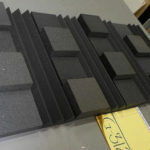 They come complete and ready for installation. 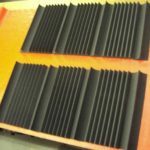 If you are interested in adding more items, feel free to call us with the quantity you need and we will do everything we can to meet your personal needs. 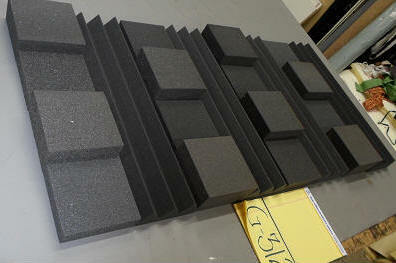 We also have multiple types of colored foams for you to choose from. 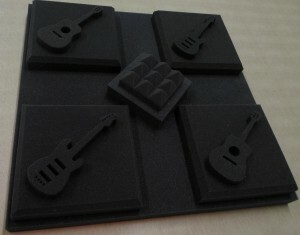 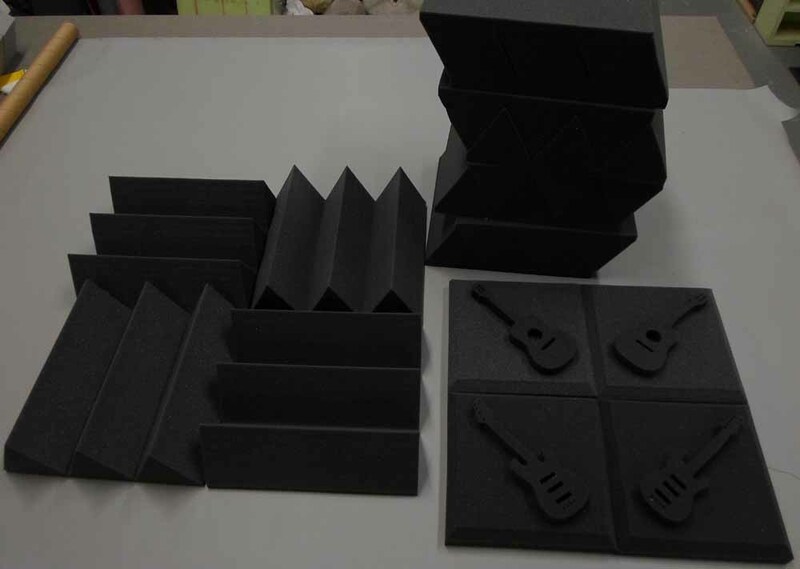 If you are interested in colored foam, feel free to e-mail us with the color you are interested in. 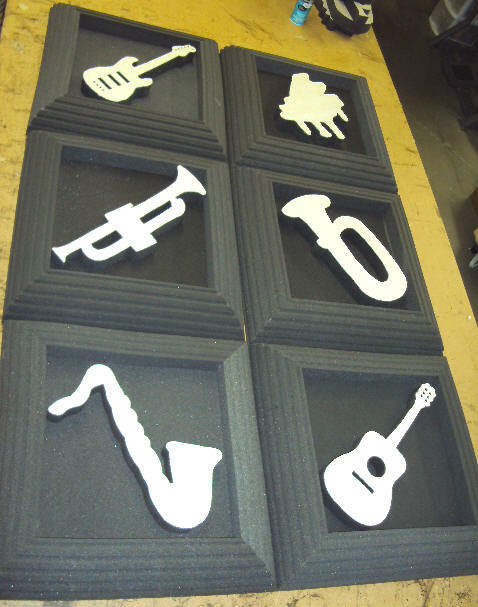 Please click any photo below for the photo to enlarge. 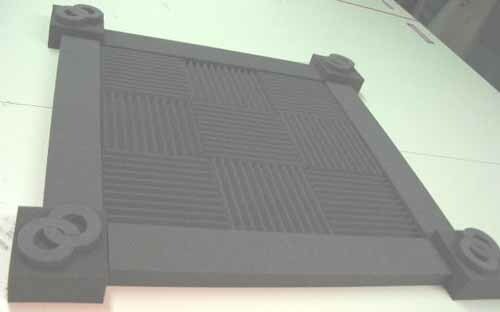 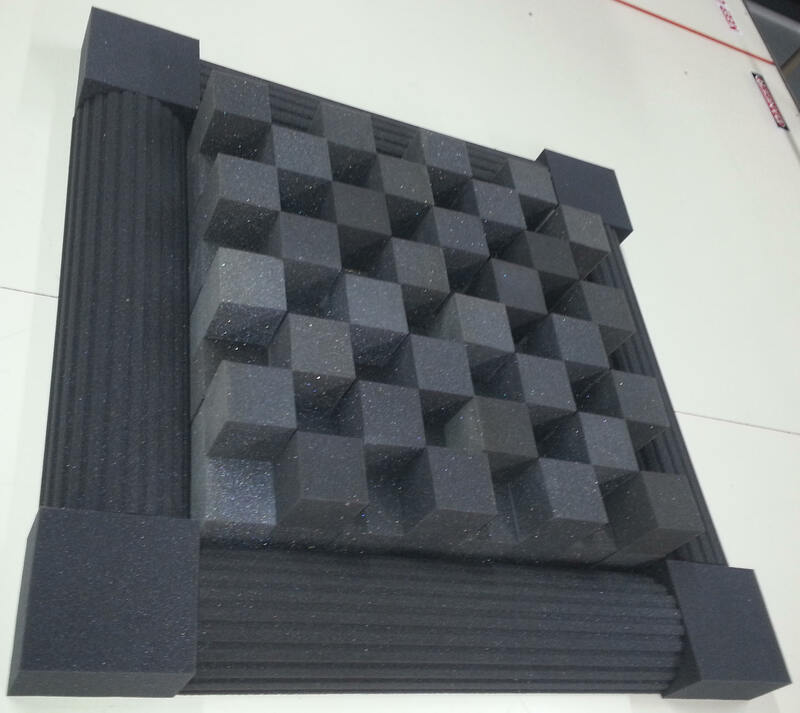 8-1/2” long x 5-1/2” wide x 3-1/2” Thick Rough surface contact us for details for a photo. 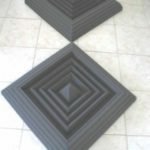 with wedge or pyramid tilesOverall size48″x 48″x 2″. 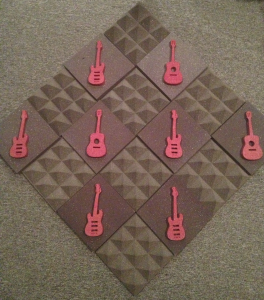 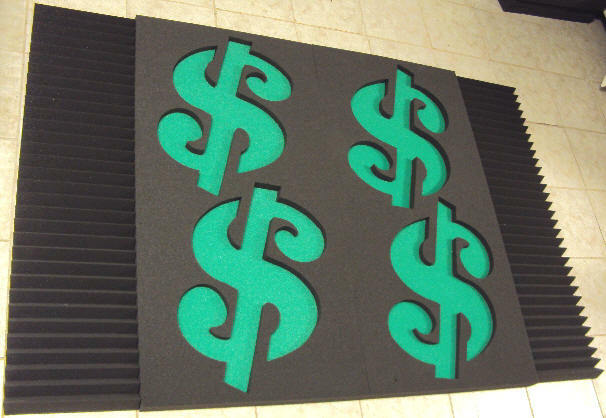 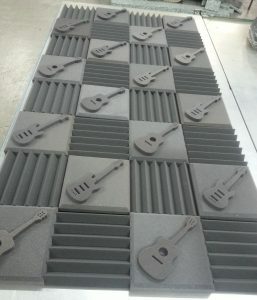 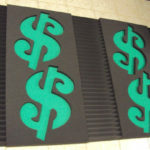 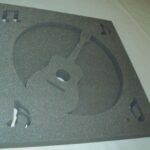 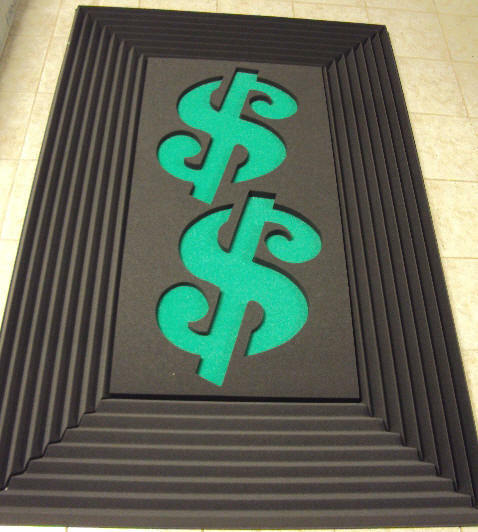 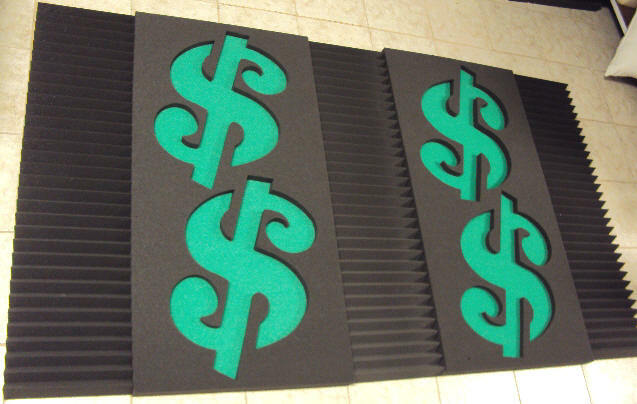 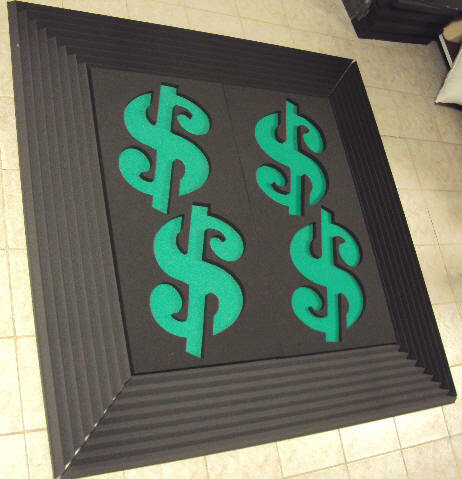 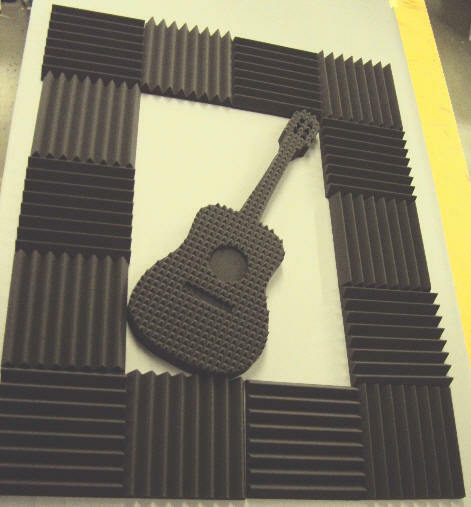 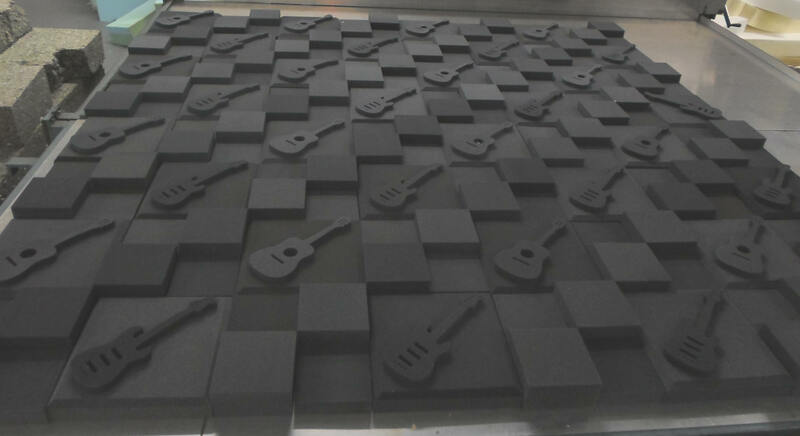 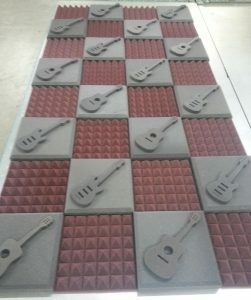 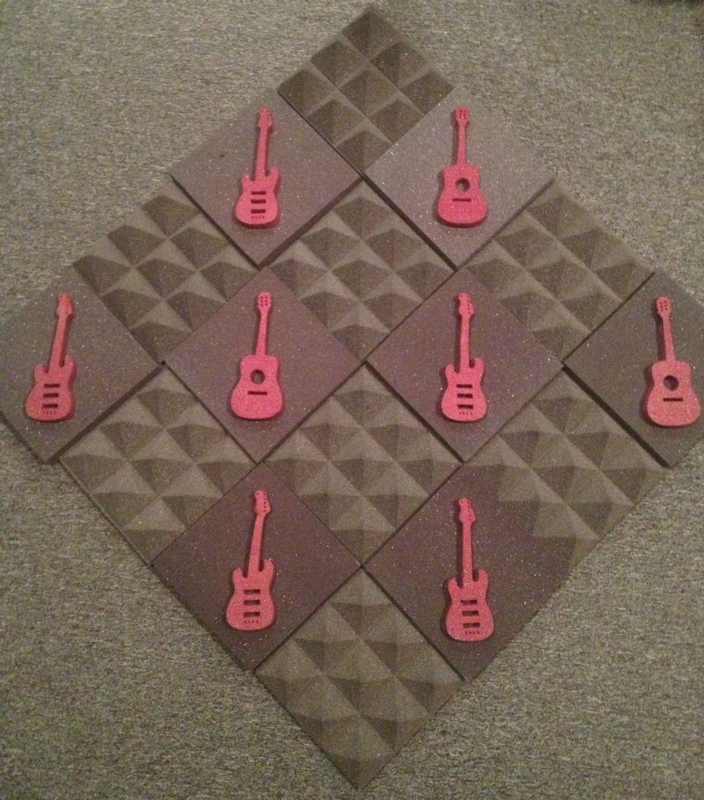 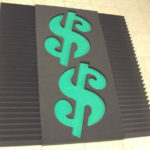 Acoustic tiles can be covered in any color vinyl fabric of your choice! 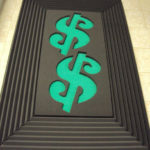 Please look below for all the colors that we offer. 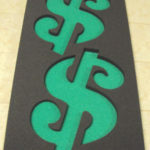 OR you are more then welcome to send 1/2 yards of fabric to us and have us glue that fabric on for you. 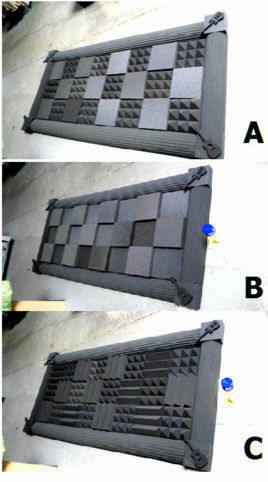 Please click the photo to enlarge. Please contact us for more details on size and prices. 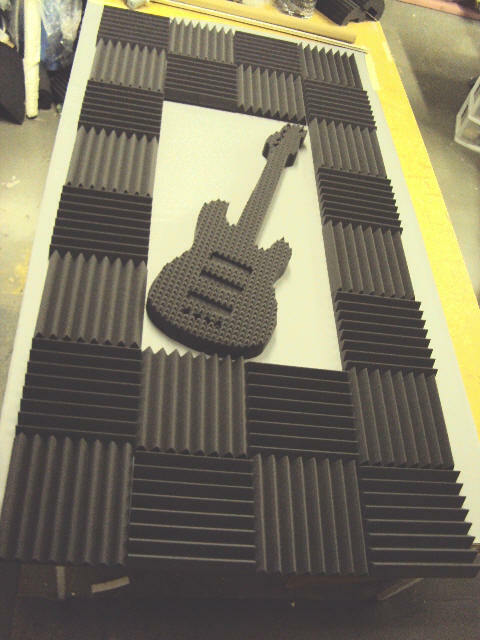 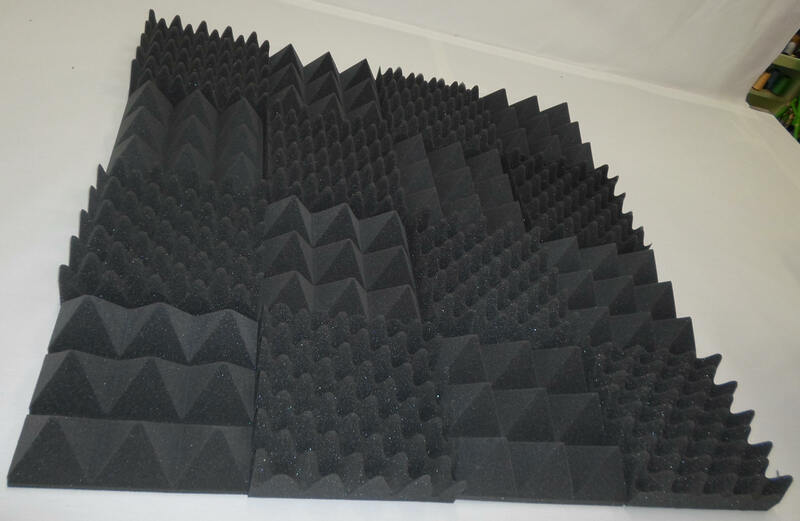 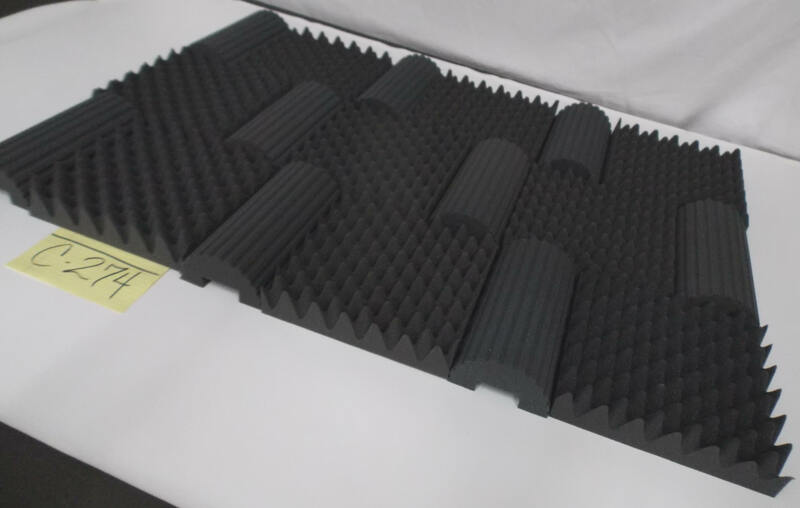 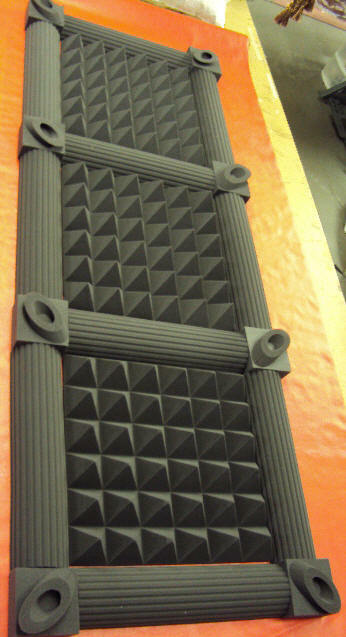 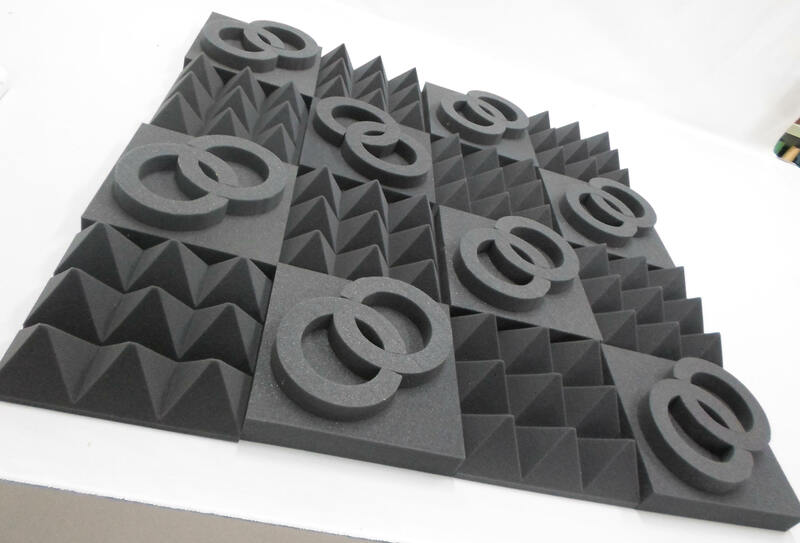 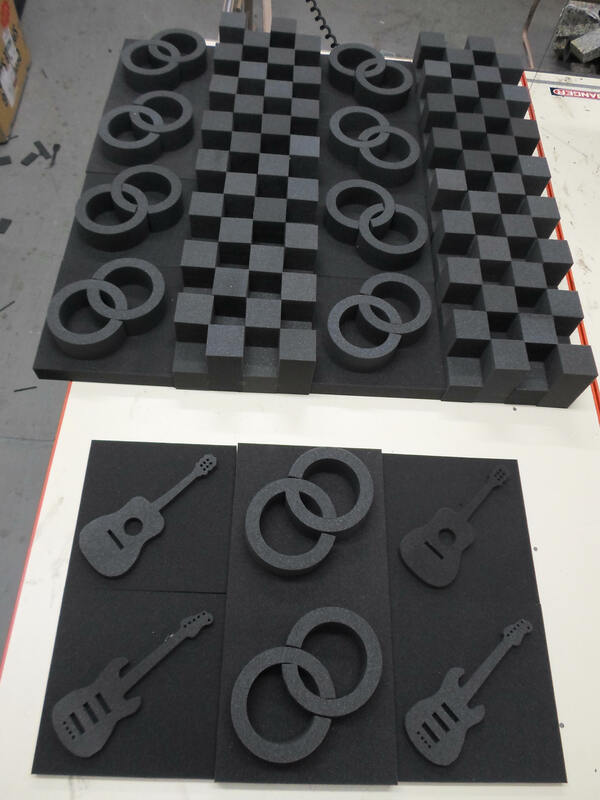 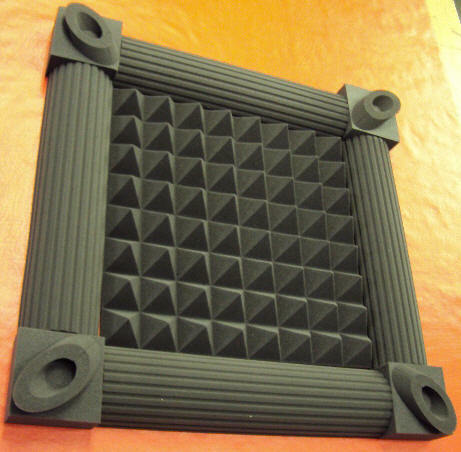 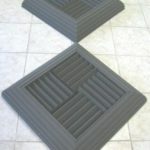 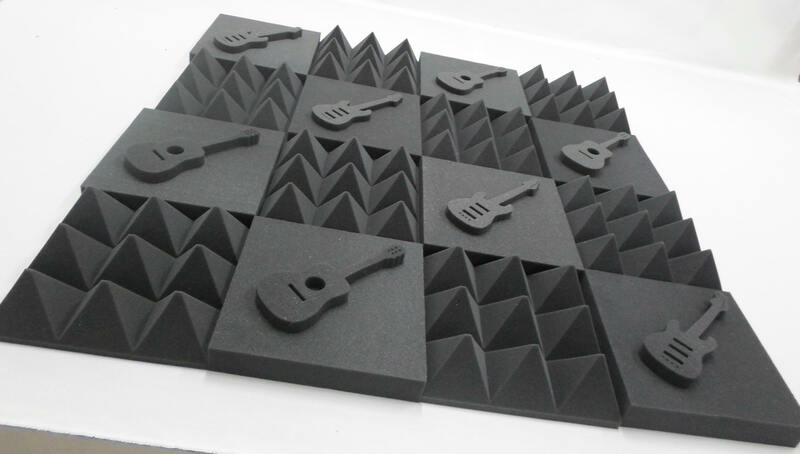 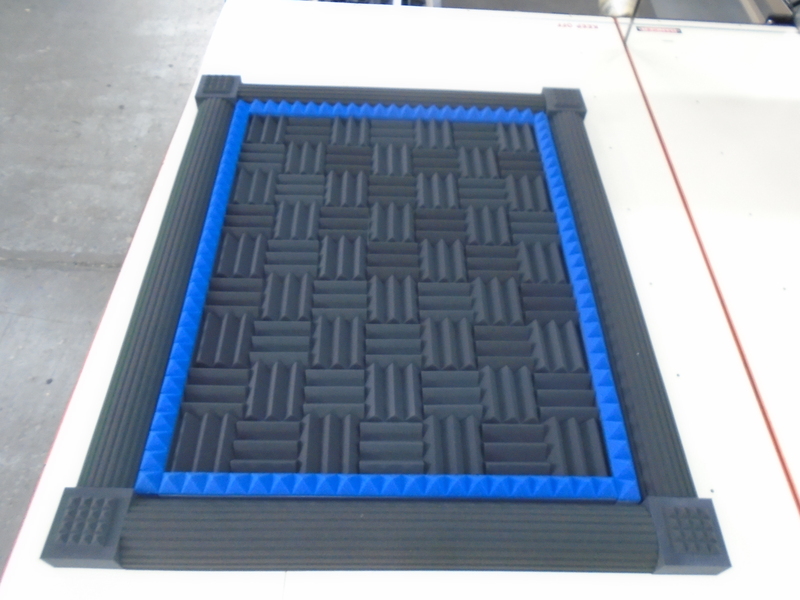 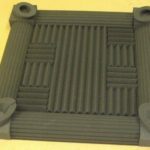 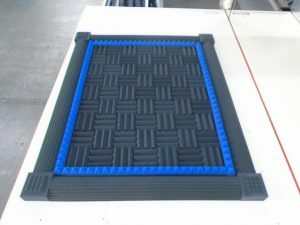 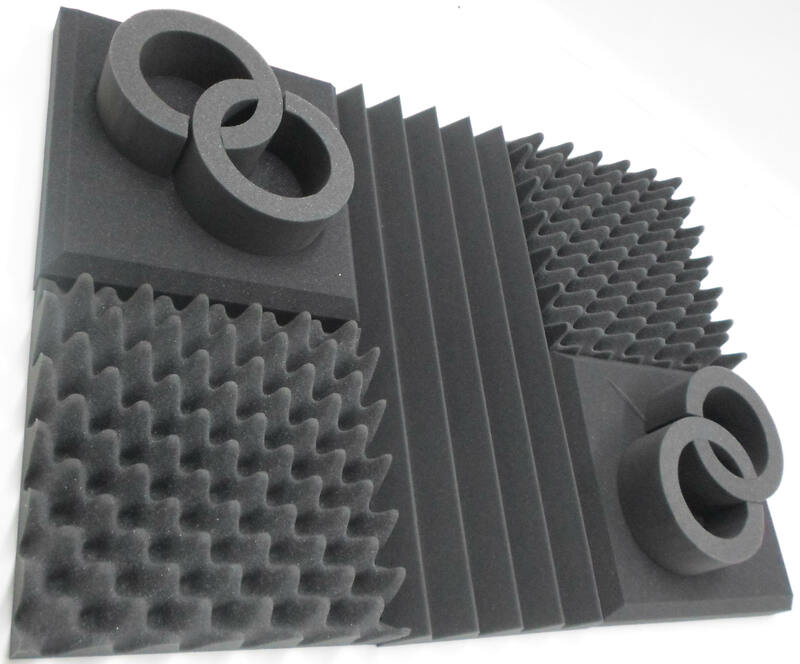 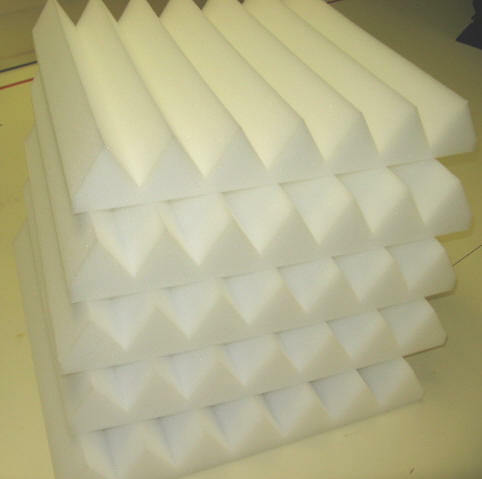 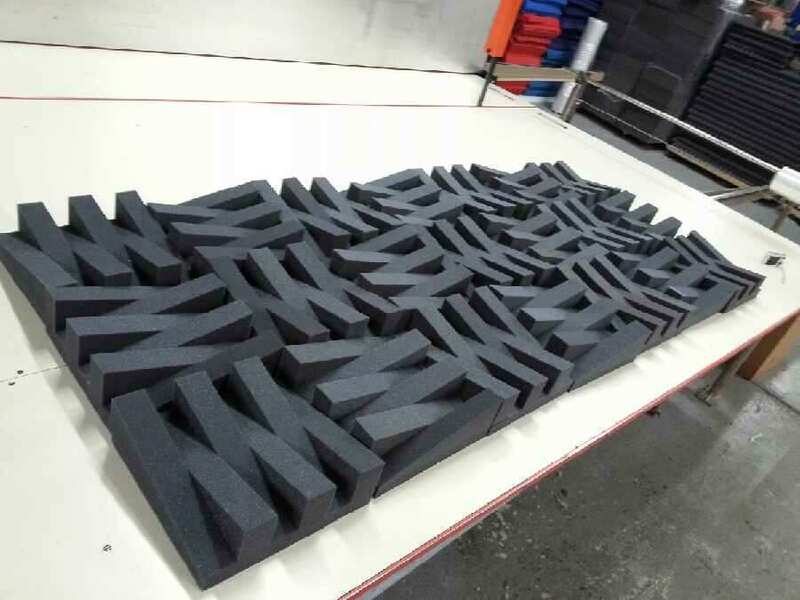 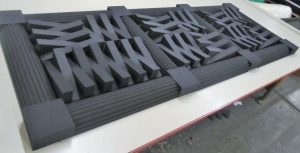 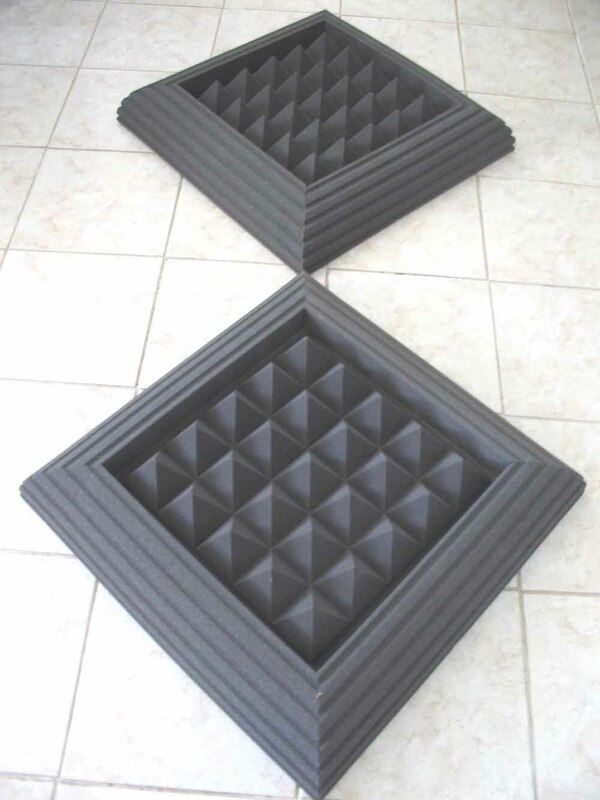 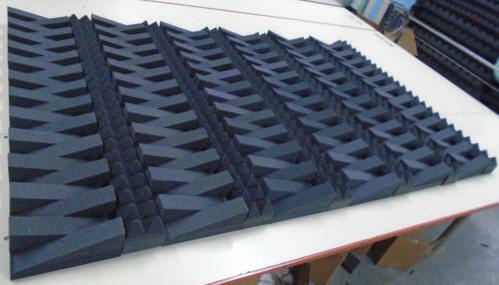 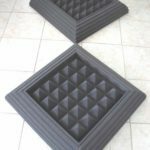 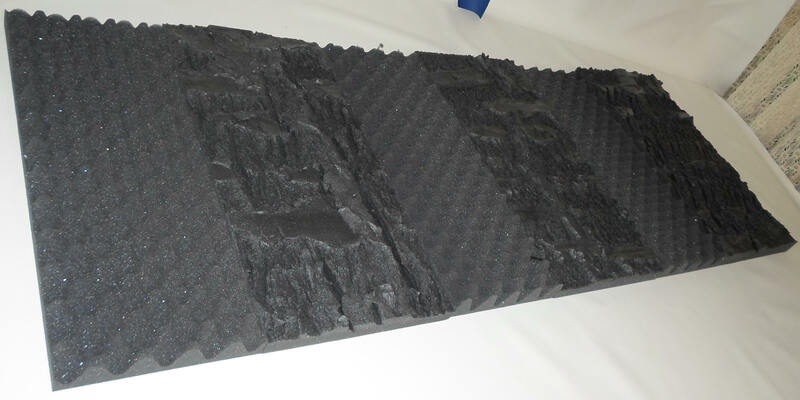 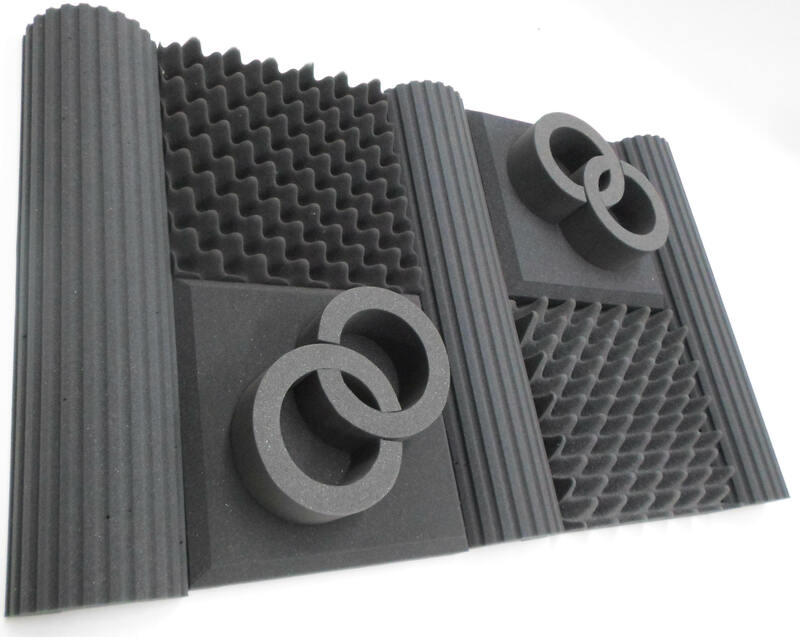 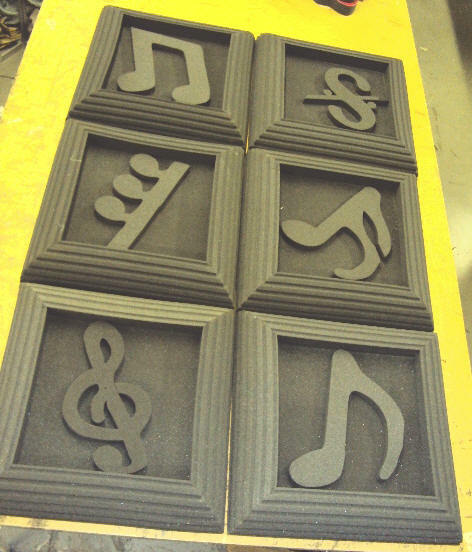 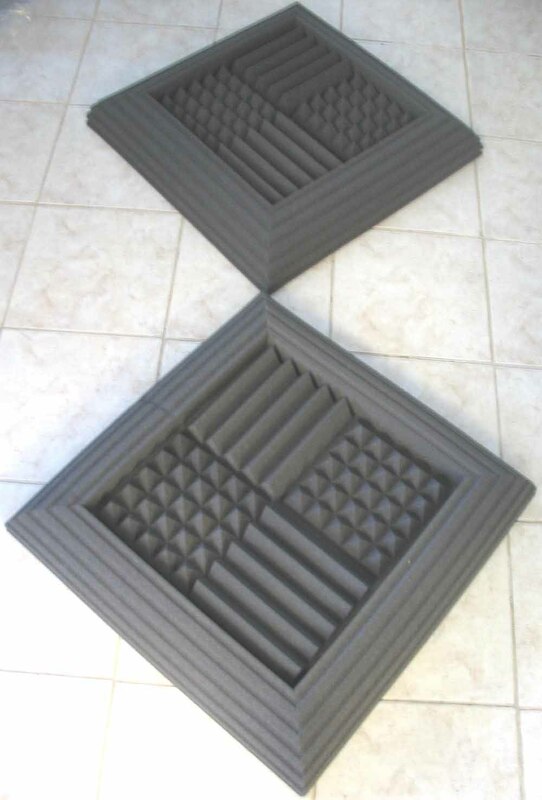 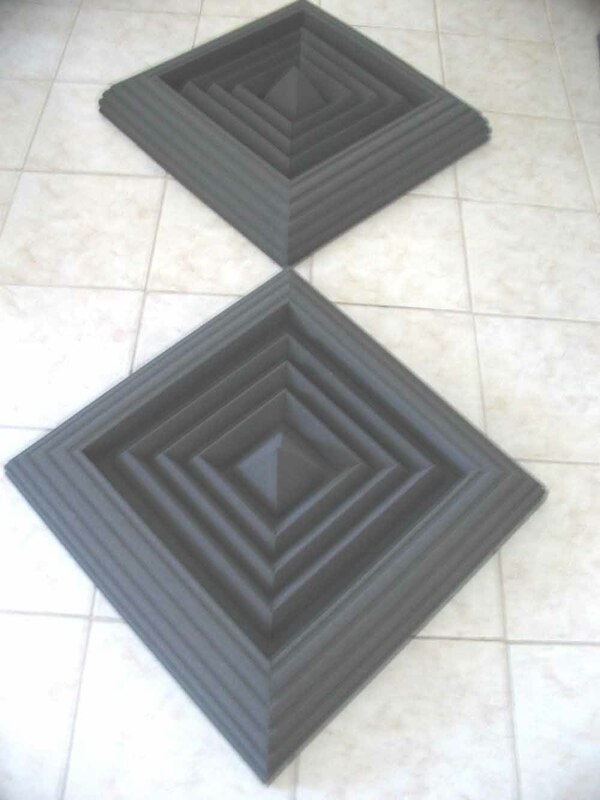 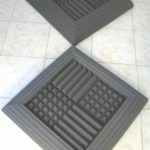 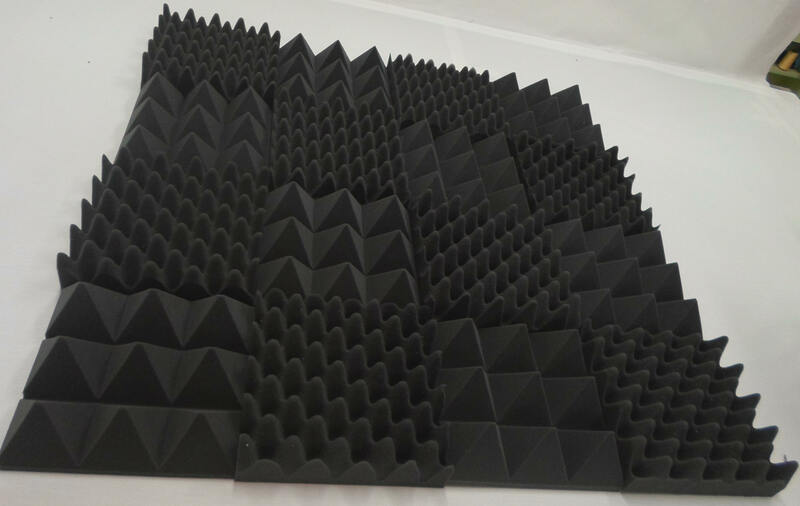 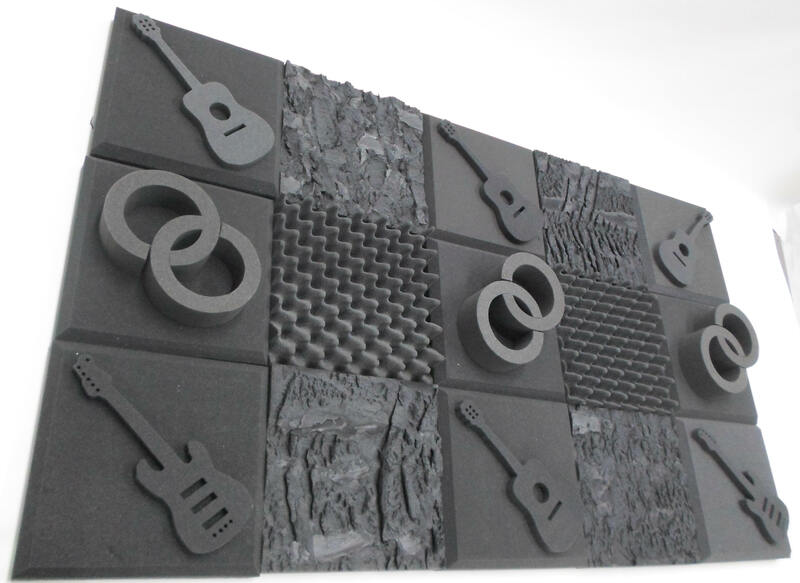 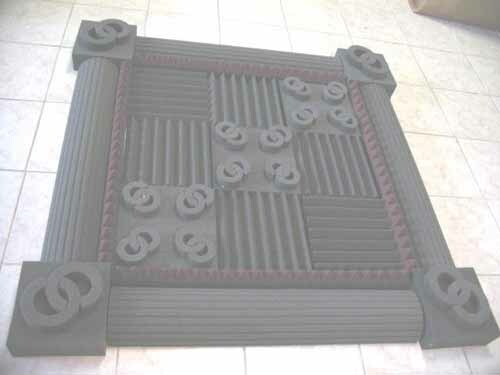 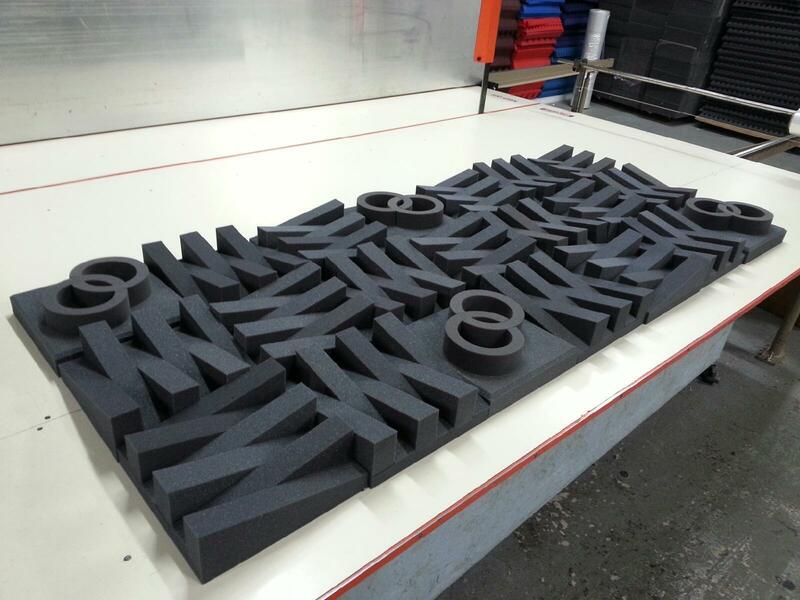 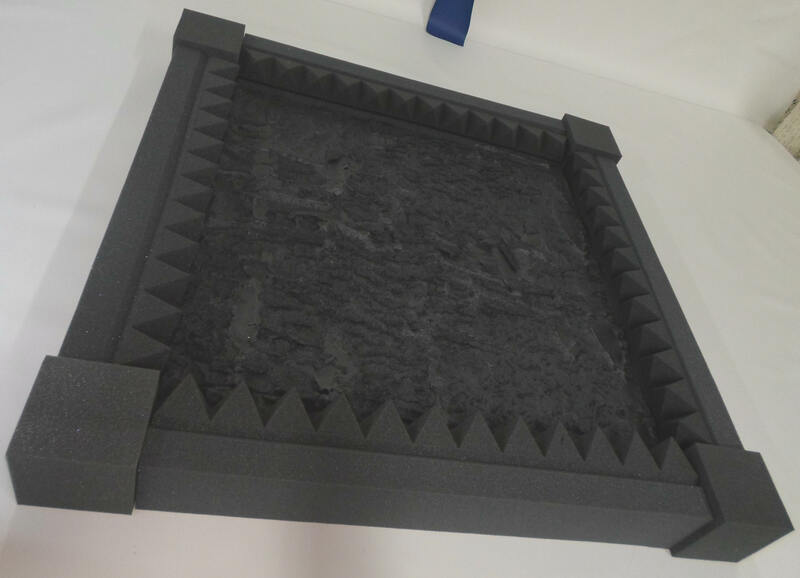 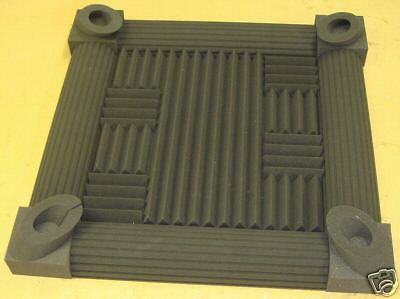 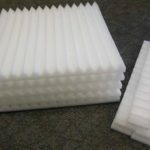 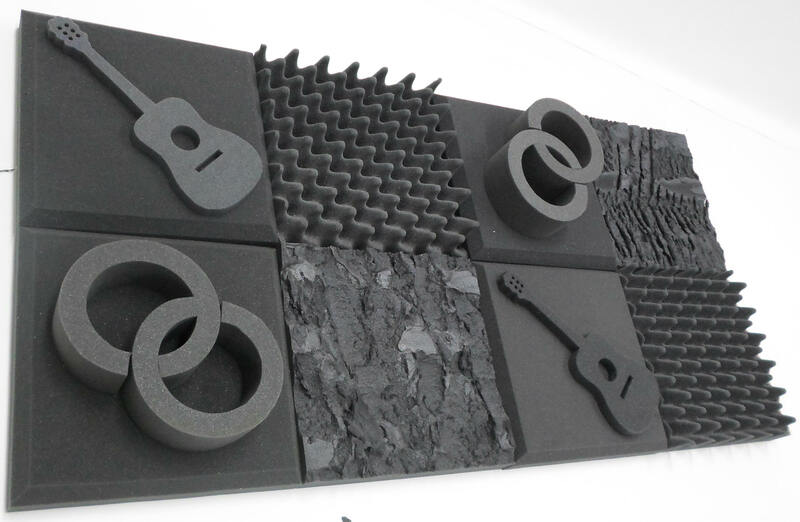 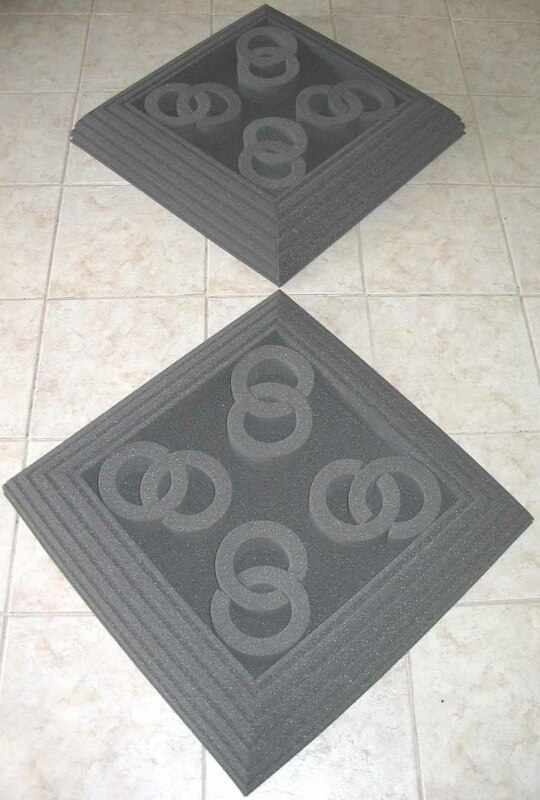 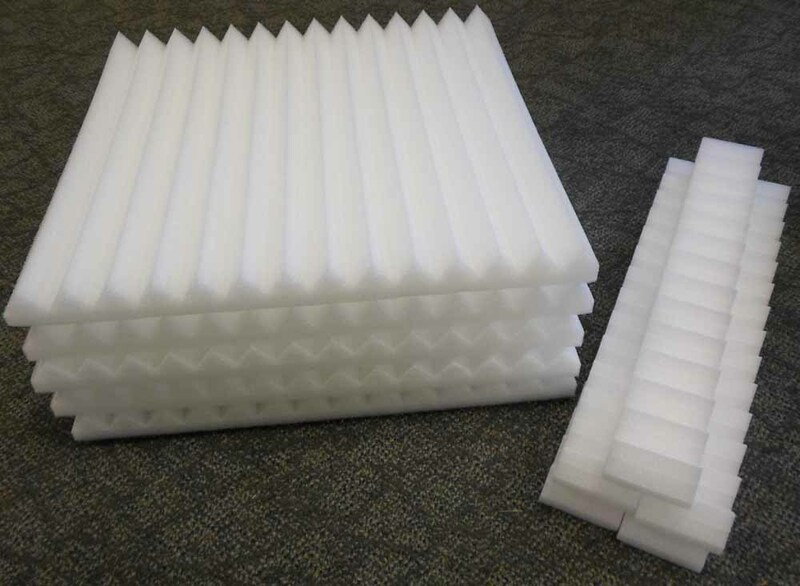 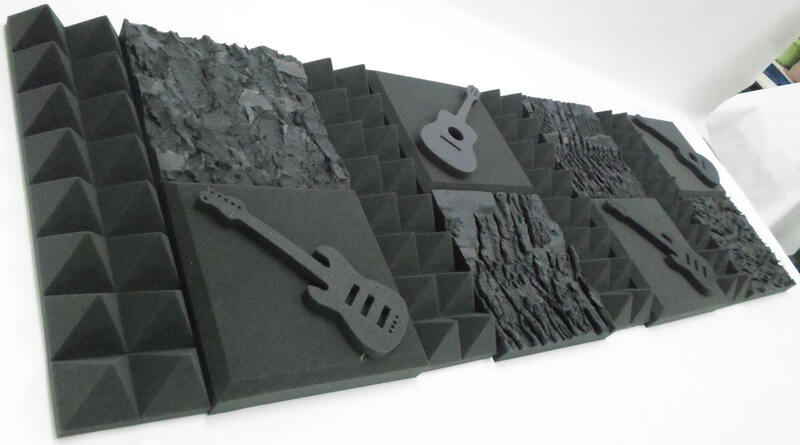 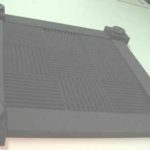 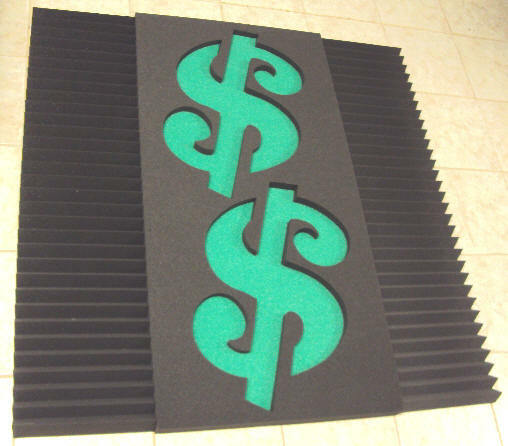 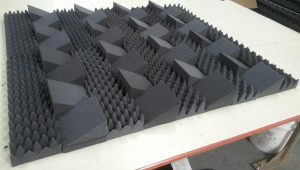 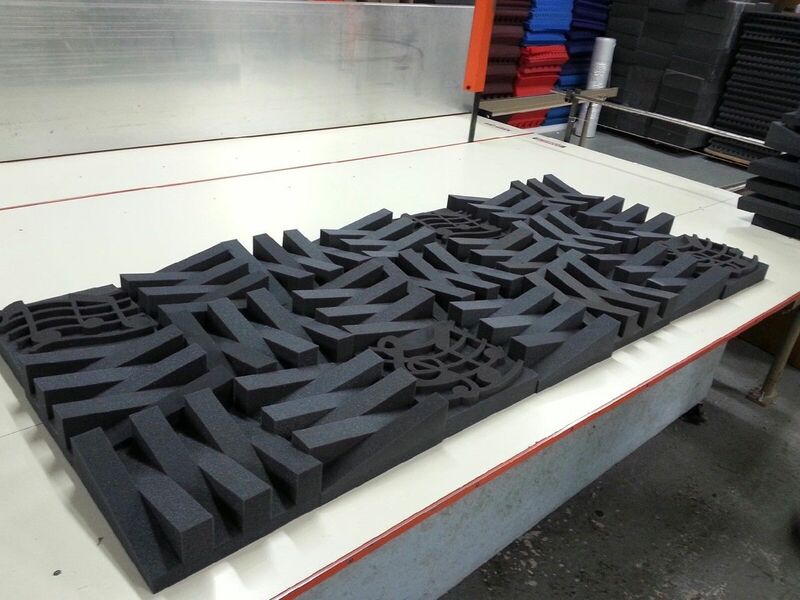 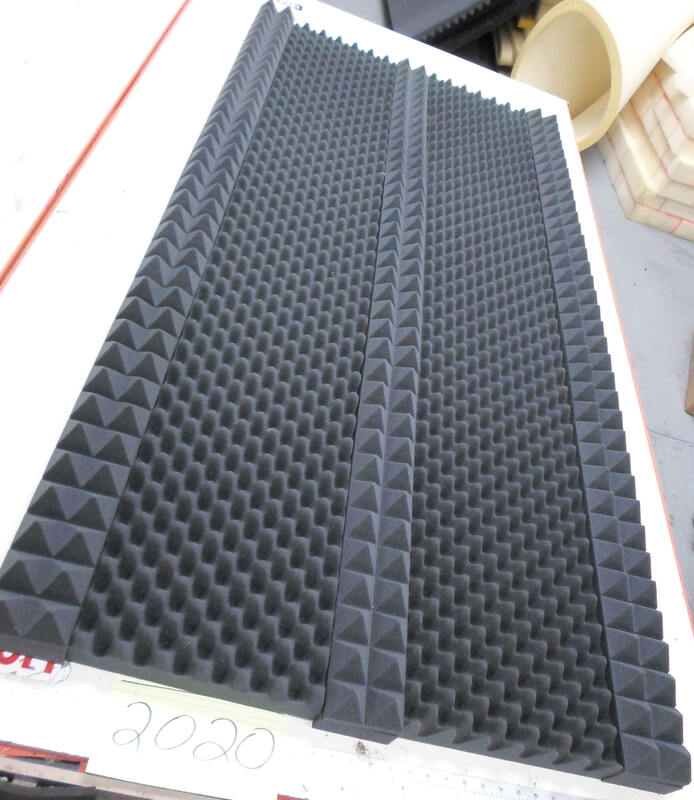 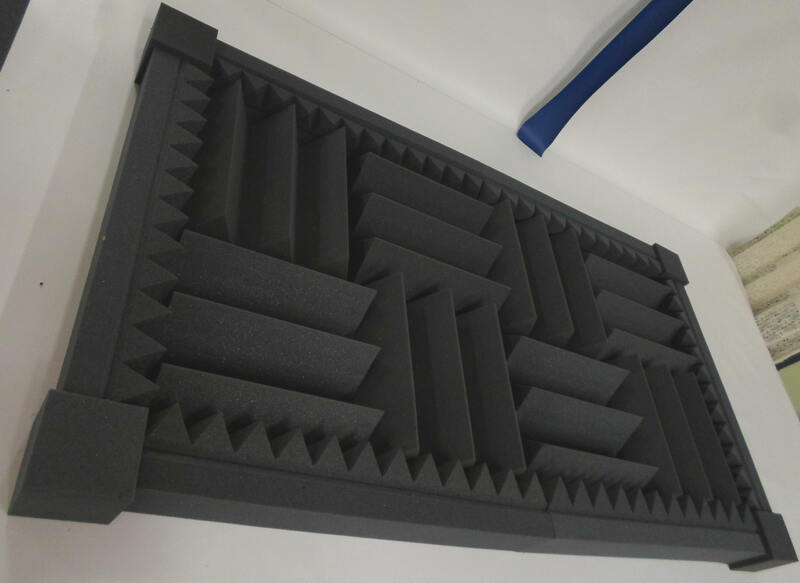 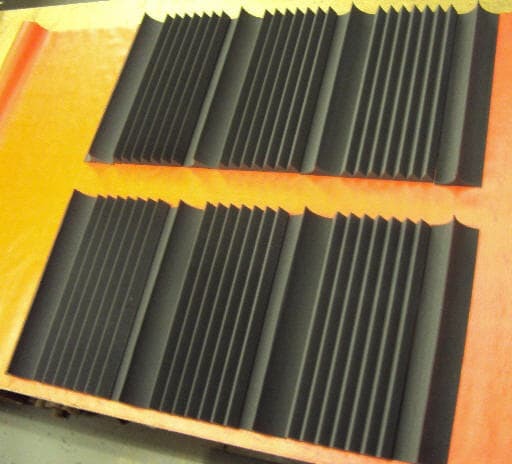 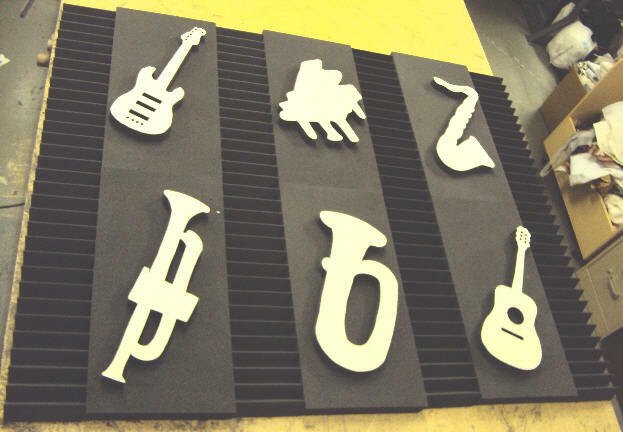 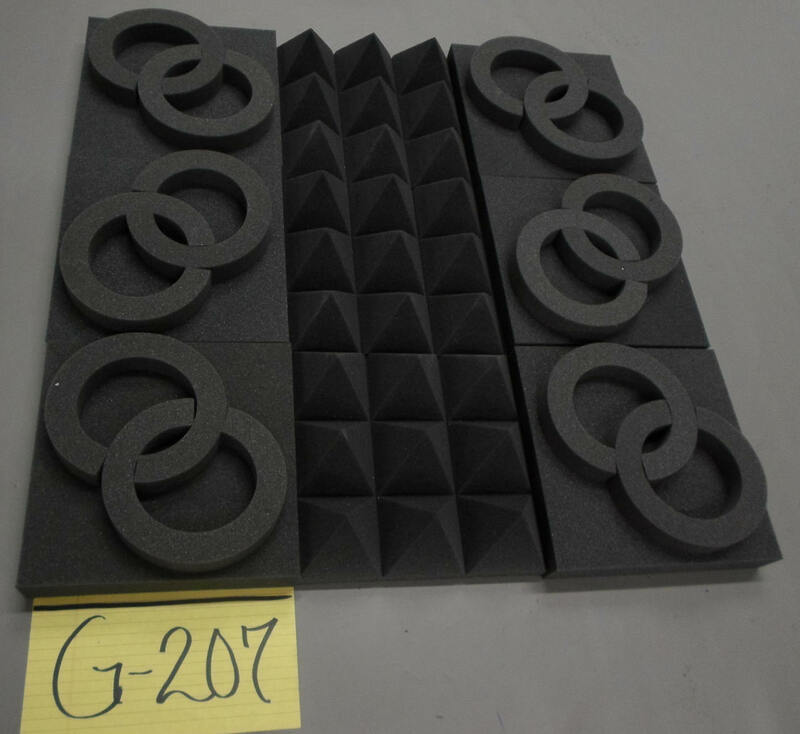 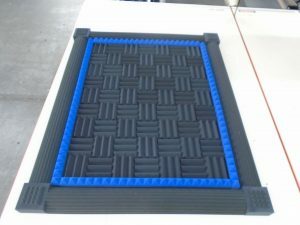 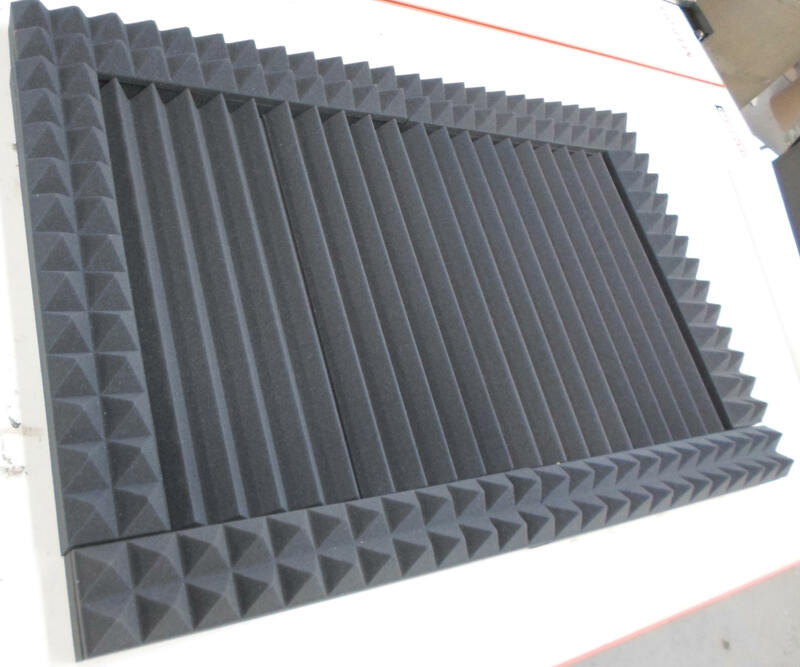 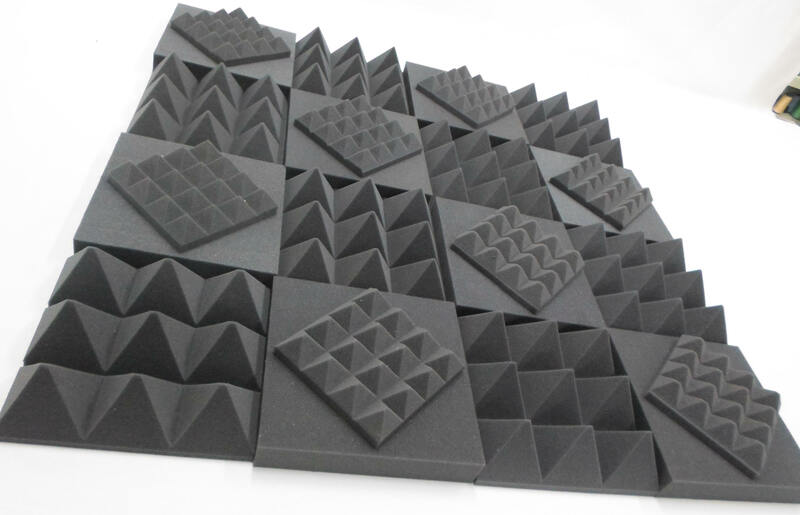 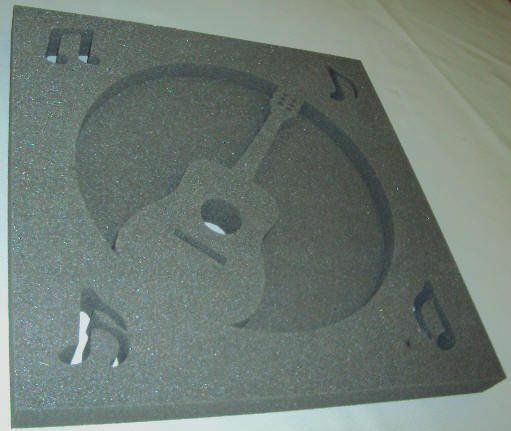 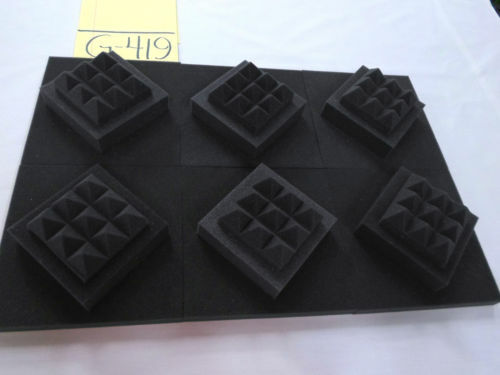 Polyethylene Foam is a closed cell foam that absorbs noise at the medium and high frequency ranges. 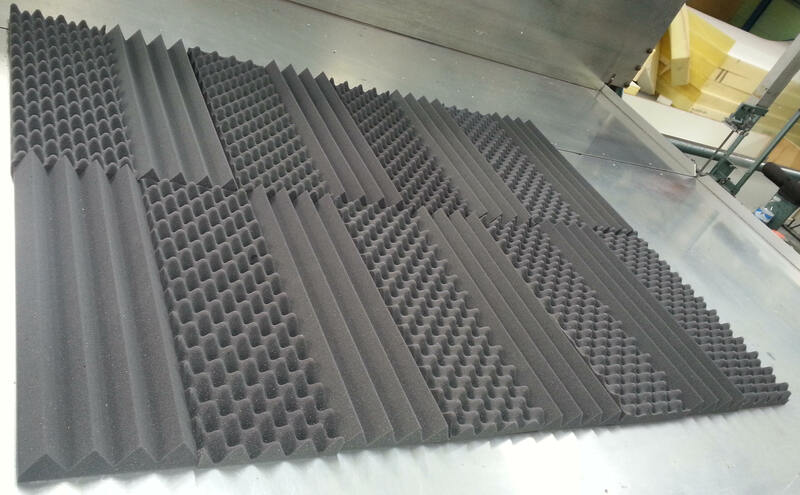 This foam is very highly rated. 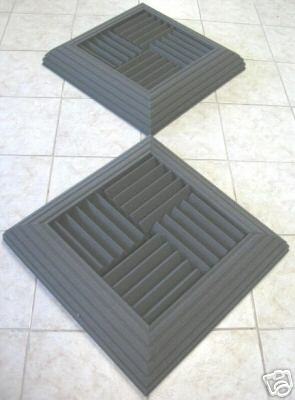 This Kit is guaranteed to sound proof your room! 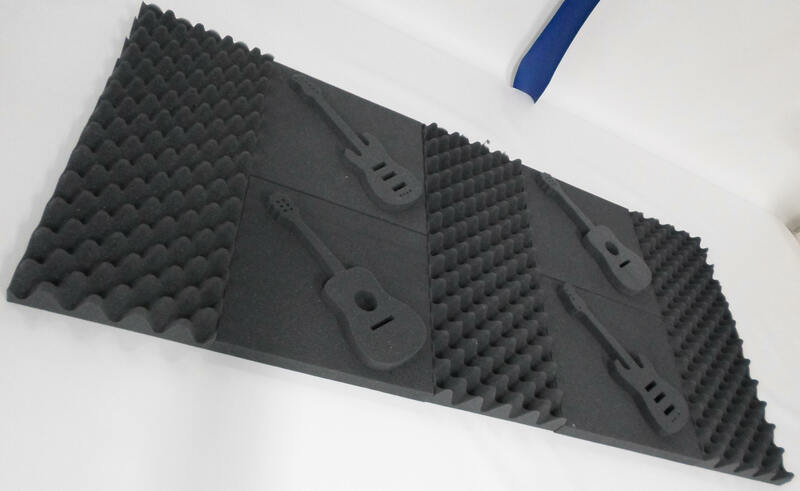 Make your room look amazing. 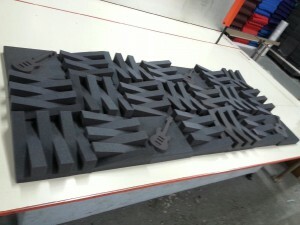 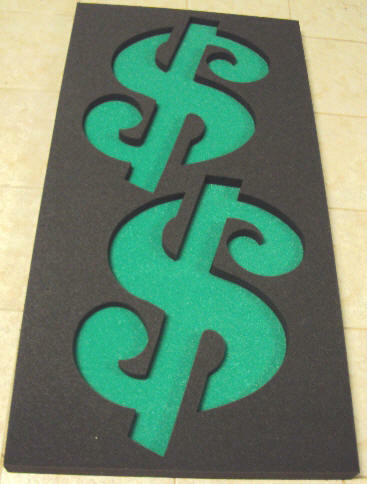 Foam columns are easy and lightweight so that they can be installed quickly and look great at the same time. 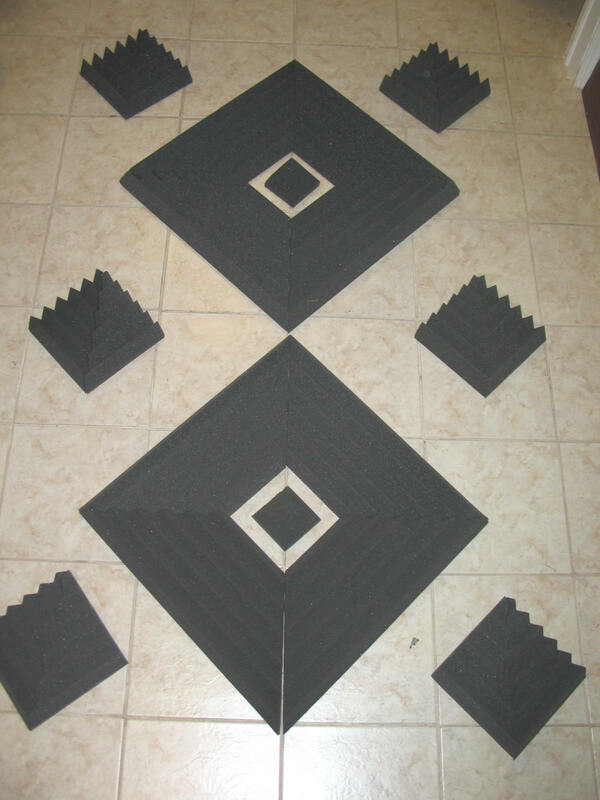 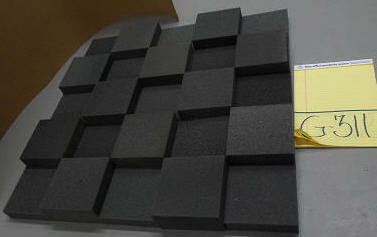 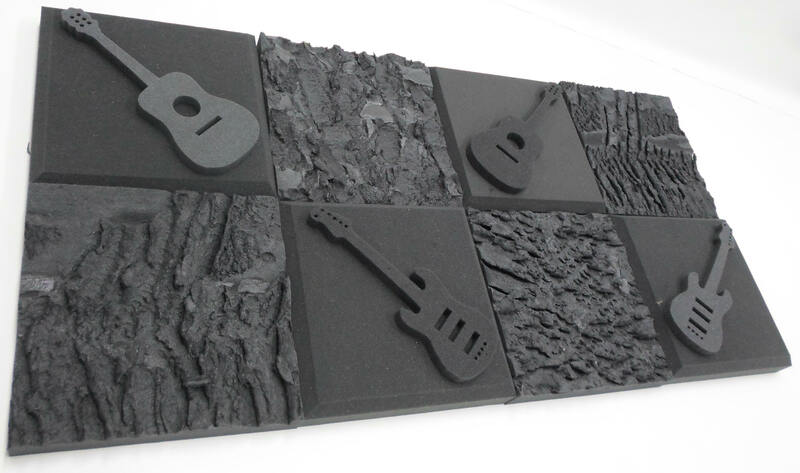 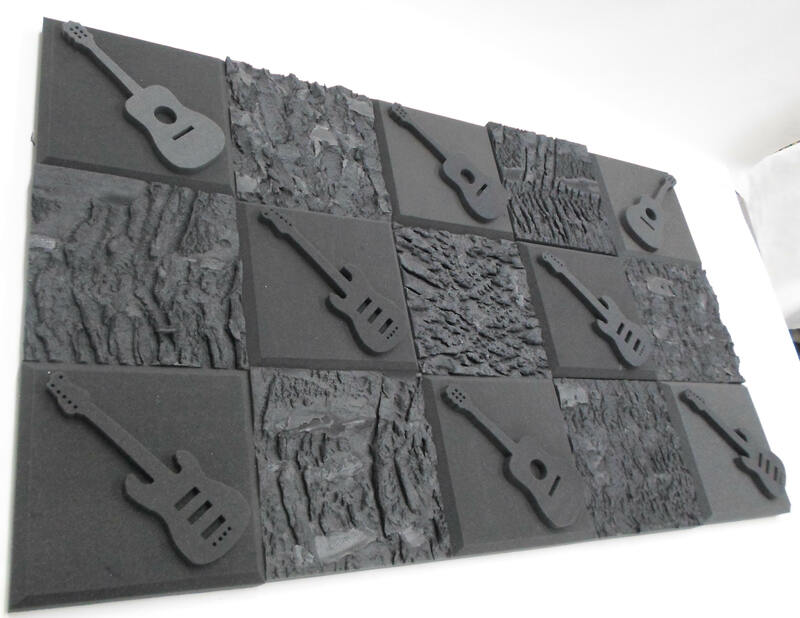 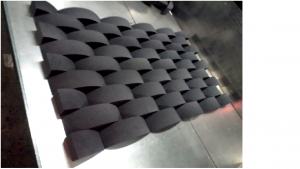 With this kit you do not have to cover the whole wall with acoustic tiles. 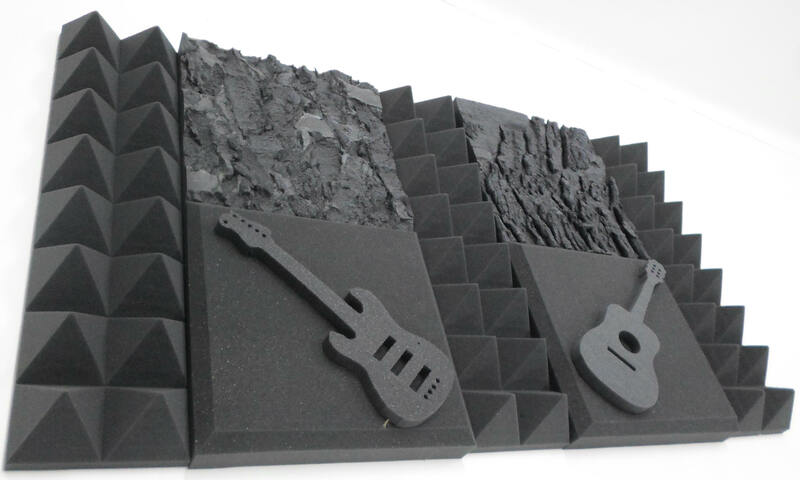 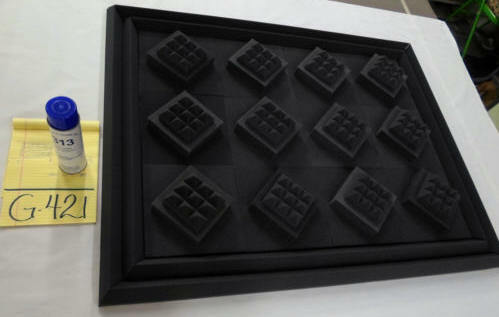 You can group pieces together or separate them, which will soundproof your room. 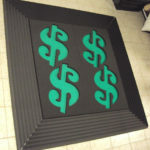 Just call (248)-284-0002 or e-mail us with the size and quantity you would like to order. 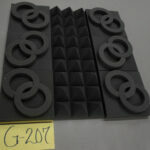 Please include your zip code for an accurate shipping price.